Scotnet was Foremost's IT's Internet Solutions Division. 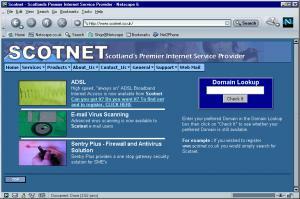 Established in 1992, Scotnet was the first Internet Service Provider to offer local rate dial-up access across Glasgow. That service soon grew to cover the whole of the UK. Scotnet is now the largest privately owned Scottish ISP. Today Scotnet offers a comprehensive range of products and services to cover the requirements of all business types from sole traders to large corporations. To find out more about Scotnet's products and services, including Broadband ADSL and Website Hosting, please visit www.scotnet.co.uk/. We can demystify the jargon, and help your organisation make the most effective use of technology. Click below. Too Busy - no time! Generated by Glossary, Foremost IT's web-based glossary module. If you would like Glossary to appear on your own website, please contact us. For more information about Scotnet, please fill in the following contact form and one of our consultants will get in touch.